The idea for Rexx came about when Bis leaders recognised a problem in double handling product when it was being moved from pit to processing. The solution was a 20 wheeled, long range, out-of-pit hauler that would combine the distance capacity of a traditional off road haulage solution with the ability to go out-of-pit. Rexx has a vast range of innovative features that make it a deserving winner of the award. These include an industry leading turning circle of just 13.6 m, a four-times greater distance capability than a conventional dump truck and the capacity to carry enough fuel for at least two 12 hour shifts, eliminating downtime needed for refuelling. Rexx is unique in its ability to be used with a range of interchangeable bins to suit different commodities and applications. In line with Bis’ focus on Zero Harm, Rexx has also been designed with the highest safety requirements in mind, and is equipped with Bis’ fatigue management system, 360° view cameras and reversing cameras for greater hazard management. Rexx delivered impressive results in recent trials carried out at a working mine in the North Eastern Goldfields. 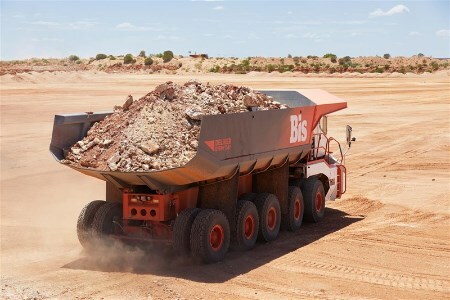 Testing at Minara’s Murrin mine, carried out in ‘real life’ operating conditions, has shown that Rexx has the capacity to deliver up to a 30% reduction in operating costs compared with conventional dump trucks. It is no wonder Rexx is in the spotlight, with interest flooding in from major miners both internationally and within Australia.